Wisconsin 4-H License Plates Available! Wisconsin 4-H and Department of Transportation have joined to produce a 4-H license plate! The brand new Wisconsin 4-H license plate is now available for your car, truck or motor home. 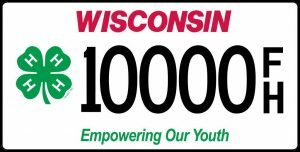 This specialty plate is available through the Wisconsin Department of Motor Vehicles and bears the message “4-H Empowering Youth”. The regular registration fee for the vehicle if the current plates expire within three months or the vehicle has no plates. The Wisconsin 4-H Foundation provides essential support for the Wisconsin 4-H Youth Development Program – A program of the University of Wisconsin Cooperative Extension. Annually, nearly 150,000 Wisconsin youth take part in 4-H programs throughout the state, supported by more than 20,000 adult and youth volunteers. Burnett County 4-H is on Pinterest! Burnett County 4-H members and leaders have pinned ideas about 4-H project areas, volunteer training, and club support. Visit pinterest.com/burnettcounty4H/ for help, ideas, and fun!